Senators, advocates, and other stakeholders in immigration reform have been dueling over border enforcement, federal benefits and entitlements, the pathway to citizenship, and even gay bi-national couples. The sparring will continue through the House of Representatives soon enough. Howard Husock, vice president for policy research at the Manhattan Institute, correctly points out that missing from the debate has been the integration of millions of undocumented immigrants who will be eligible for legalization should reform pass. Husock realizes that “there’s likely to be dispute about just what that means—and how much should be spent toward the goal,” but he believes that “finding effective ways to realize these goals are far from side issues. Helping to bring the latest—and, in sheer numbers, the largest ever—wave of immigrants into the cultural mainstream will be crucial in defusing what may be lingering anti-immigrant sentiment, even if reform legislation passes.” He contends, however, that government might not be the right agent for the job and that integration is best left to philanthropists and nonprofit organizations. Indeed, an Urban Institute study of immigrant-serving community-based organizations documents why these nonprofits are best suited to help immigrants integrate into our economic, political, and social mainstream. They are embedded in immigrant communities, are founded and run by immigrants, and know the particular needs of their constituents along with the most effective way of reaching and assisting them. But will foundations and philanthropists step up to the plate and give adequate funding to immigrant-serving nonprofits that will no doubt be inundated by individuals and families seeking legal and other support services? Adriana Kugler and Patrick Oakford, senior fellow and research assistant respectively, at the Center for American Progress, estimate about 85 percent of 10.6 million undocumented individuals will be eligible for legalization. Community-based organizations are already stretched to the limit as it is. The current version of the Senate bill does include a provision authorizing about $50 million in grants to nonprofits that assist eligible immigrants through the process, but this will most likely be stricken out as the debate continues. Experts from all sides have made projections about how much immigration reform might cost, even though the details are in flux and passage of legislation is not guaranteed. Nonetheless, we need to factor in how much it would cost immigrant-serving nonprofits, and the philanthropic class had better be ready to loosen their purse strings. Originally posted on Nonprofit Quarterly’s Newswire. This week, senators will be offering amendments to the immigration bill crafted by eight of their colleagues. Advocates have been working overtime on lawmakers to make sure that changes in the measure reflect their interests. LGBT groups have been among the most vocal, protesting the exclusion of same-gender bi-national couples and insisting that any bill voted on by the full chamber include LGBT immigrant families. Religious fundamentalists and other conservatives have weighed in, threatening to withdraw support if immigration reform were inclusive. “We strongly would oppose the provision and it could force us to reconsider our support for the bill,” said Kevin Appleby, director of the Catholic Bishops’ Office of Migration and Public Affairs. Originally posted on Nonprofit Quarterly Nonprofit Newswire. 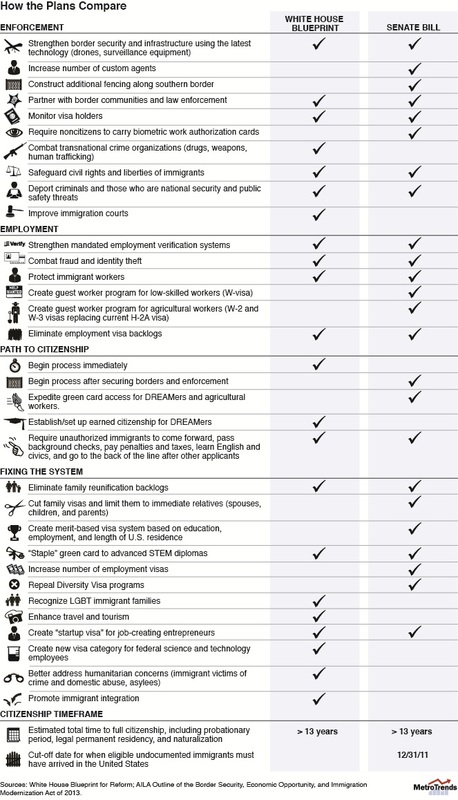 The Senate’s “Gang of Eight” released details of its immigration reform legislation last week, so the Urban Institute updated its earlier infographic comparing the White House’s immigration blueprint to the Senate bill. The president and the senators are, for the most part, in sync. But differences over a few key provisions have advocates from all corners expressing concern for their constituencies, promising an intense debate moving forward. As could be expected from some quarters, immigration reform was insinuated into the Boston terror attack. The President prioritizes an immediate path to citizenship, while the Senate focuses first on secure borders and successful enforcement. Under both plans, it will take eligible immigrants about the same amount of time — at least 13 years — to become U.S. citizens. The Senate bill cuts the number of family visas and repeals diversity visa programs, both of which are of grave concern to immigrant advocates. The president’s blueprint includes LGBT families, while the Senate’s bill purposely leaves them out. The immigration bill is far from perfect and the House of Representatives should be offering their own legislation shortly. We can expect various groups lobbying hard to ensure that the final bill, should there be one, covers their interests. We can also expect the Gang of Eight to fight hard for what the president has characterized as a compromise effort. Sen. Rubio, in particular, has come out swinging. His presidential ambitions, after all, are at stake. The President prioritizes an immediate path to citizenship, while the Senate focuses first on secure borders and successful enforcement. Under both plans, it will take eligible immigrants the same amount of time—at least 13 years—to become U.S. citizens. The Senate bill cuts the number of family visas, which is of grave concern to immigrant advocates. It also repeals diversity visa programs. The President’s proposal includes LGBT families, while the Senate’s bill purposely leaves them out. Originally posted on Urban Institute’s MetroTrends Blog. 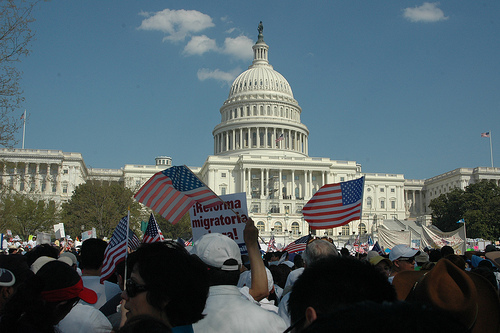 The Senate Gang of Eight has finally released its much-awaited immigration legislation. The Border Security, Economic Opportunity, and Immigration Modernization Act of 2013 is characterized by President Obama as a compromise bill which is largely consistent with his own principles for immigration reform. The proposed law further fortifies our southern border and bolsters law enforcement, provides a path to citizenship for undocumented immigrants, creates guest worker programs for low-skilled and agricultural workers, increases the number of employment visas, and eliminates employment and family visa backlogs. It also cuts and limits the number of family visas and repeals diversity visa programs while creating a merit-based visa system based on education, employment, and length of residence in the U.S. The comprehensive bill excludes LGBT families. Lesbian and gay Americans and permanent residents will still not be able to sponsor their loved ones for permanent residency. The exclusion of families like mine comes as no surprise. I have been in Washington, D.C. long enough to know that compromises are made and deals brokered when crafting legislation. I am also aware that some constituencies are more influential than others. In order to get bipartisan buy-in, both sides had to give some. The Democratic senators decided that tens of thousands of LGBT families are dispensable. While the LGBT community has sway with Democrats, it was not enough in this battle. There are far more important players to please and the “greater good” to consider. How do I feel? Angry, certainly. Resigned, mostly. This is how our democracy works. In the coming months, various interest groups and their champions will lobby Congress to make sure that they get something in the final immigration reform package. LGBT organizations and coalition partners will vigorously protest the exclusion of lesbian and gay binational couples. But at the end of the day, we will still be left out in the cold. And President Obama, who includes us in his own reform blueprint, will sign a comprehensive – but not inclusive – immigration law. And, I will be rational, saying to myself that this is a good thing. Originally posted on Feet in 2 Worlds and the Huffington Post.